Now celebrating 10 years on the Internet, with no sales, no profits and no business model, and no updates sunce 2006, this is Harry's Snowdomes on the Web, which should have been known as www.whatididlastsummer.com. Where Have All The Snowdomes Gone? The Golden Age of Snowdomes is over. 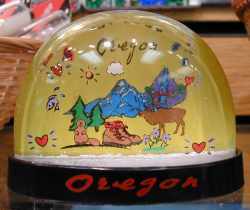 Tourist shops rarely stock the kind of domes I grew up with. Those snowdomes contained a scene unique to the area where it was sold, with a little sign inside that proudly proclaimed its "origin", although everyone knows they really came from Hong Kong. Today, the industry has gone to generic snowdomes, with interiors that could be anyplace, with the name stenciled on the outside. This site celebrates the modest little tourist dome, almost always blue in color and rich in history and algae. They can still be found and I'm searching. I usually find my snowdomes the hard way, looking for them when traveling. I love road trips anyway, and if I see a detour off the highway to a likely roadside attraction, I'll take it to see what's there. This is not a serious collectors web site. It's just for fun. Stay a while and I hope you enjoy your visit. One final note. I keep getting mail from people who think this is a snowdome store. No we don't sell them. We just buy 'em.